Summary: Internationally acclaimed sand artist Sudarsan Pattnaik on Saturday created 1000 sand Santa Clauses at Puri beach. This will be another record to his name in the Limca Book of Records. He took four days and 1000 tons of sand to carve these sculptures. 35 of his students accompanied him to achieve this success. 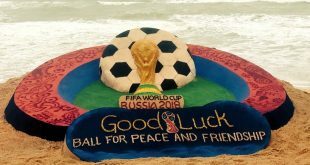 Puri: Adding yet another feather to his illustrious cap, internationally acclaimed sand artist Sudarsan Pattnaik on Saturday created one thousand sand Santa Clauses at Puri beach here. Sudarsan aims to create yet another world record by achieving the feat. 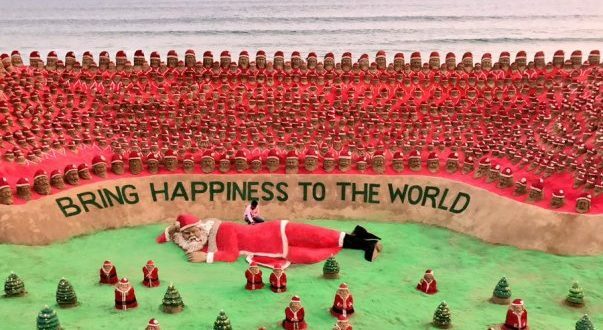 He created the sand Santa with the message “Bring Happiness to the World”. This year, Sudarsan tried to break his own record which he had created in 2012. In 2012, he had created five hundred sand Santa Clauses which was placed in Limca Book of Records. “After getting confirmation from Limca Book of World Record, I have started my work as per their instruction and completed this. Hope this will place in Limca Book of World Record,” said Sudarsan. 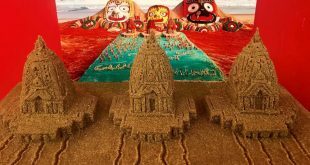 Pattnaik took four days and used about 1, 000 tons of sand with some colored sand to carve this one thousand sand Santa Clauses. About 35 students of his sand art school joined hand with him to finish this. Puri is a tourist attraction place where lakhs people come to visit during the Christmas and New year. Every year, Sudarsan organizes a sand art festival during the Christmas holiday which attracts lakhs of art lovers. The festival will continue till January 1, the New Year. “I always try to give some awareness messages through my sculpture to the world. So, I chose the awareness about global happiness through Santas as the subject at the year-end,” said Sudarsan. The Puri beach installation wasn’t the first time Sudarsan has attempted a record-setting number of sand sculptures in one place. He created 500 sand Santa Clauses in 2012 and 100 sand Santa Clauses in 2009, setting a record in the Limca Books of Records. 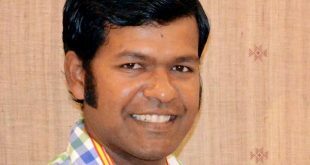 So far, Padma Shri awardee sand artist Sudarsan Pattnaik has participated in more than 50 international sand art championships and festivals around the world and won many prizes for the country.